Setting out on the trail with your horse is a magic moment. The promise of quiet solitude, the beauty of nature, relaxing with friends, the companionship of a beloved horse and enjoying a bit of adventure are all part of the attraction of trail riding. How did this inviting trail become available to you? Did you develop a relationship with the landowner or manager, or is there any relationship at all? Good relations with both public land trail managers and private landowners are imperative. Do you have a written agreement or an informal understanding? And do you show your respect for the owner/manager by using trails responsibly? Just as trail riding contributes to your happiness quotient, treating the land with respect contributes to the durability and availability of your trail. You should know the condition of your trails before you ride, especially during inclement weather. Thoughtlessly slogging through wet areas can cause extensive damage and create unsafe conditions. And it can lead to loss of trail access. It’s not uncommon for a private landowner to deny access to existing trails on their land, posting the dreaded No Horses Here sign. Public land managers, citing damage to sensitive lands, post Access Denied notices. Disappointing, yes; and often irreversible. 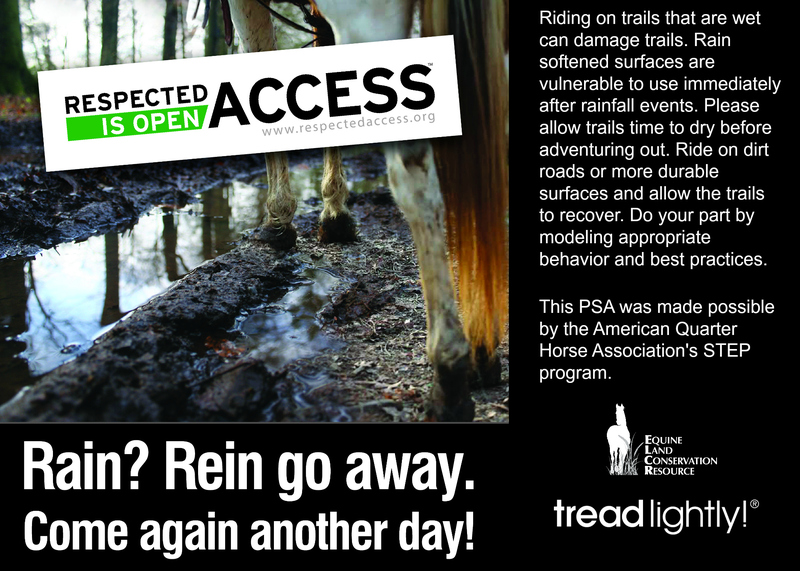 Education and proper stewardship are critical to maintaining trail access for horsemen. 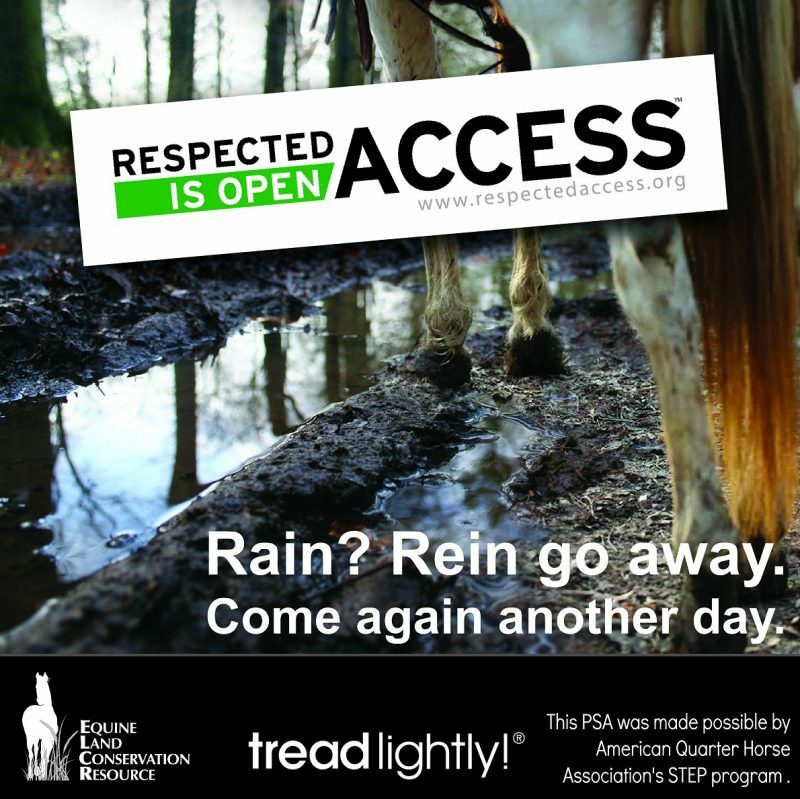 With support from the AQHA STEP program, ELCR has partnered with Tread Lightly!, a national organization concerned land stewardship, to launch the “Respected Access is Open Access” campaign. The purpose of this campaign is to educate trail riders and promote responsible stewardship of trails in order to protect access. How does careless use of trails affect the owner and the land? And how can you prevent closure of your trails? Riders and other users tend to avoid the wettest or most eroded part of the trail and traverse the edges, a habitat damage – an endless cycle of degradation continuing until the trail is no longer usable – or until the land owner recognizes the damage and puts a stop to trail use altogether. 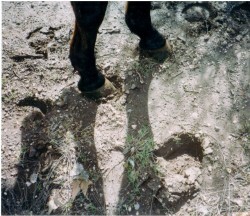 All user types will have some impact when trails are used after heavy rains, but a horse’s heavy body weight combined with compact, sharp hooves churn up wet ground, plants and soil. Eroded soil washes into the nearest stream or pond as sediment. This can happen quickly if there is nothing to protect or prevent the soil from moving. It affects the waterway by reducing oxygen and obscuring the riparian wildlife habitat. Other pollutants such as herbicides and fertilizers further reduce water quality. Downstream, it all ends up in our drinking water. When riding alone or with friends, avoid wet or damaged trail areas. Let the landowner know about damaged or wet trail areas so others can be informed. Help with trail maintenance. 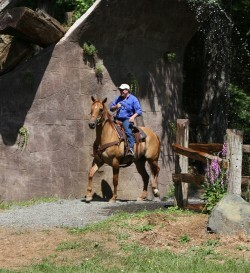 Well-designed trails drain well and stand up to equine use. But give trails a rest for at least 48 hours after a heavy or prolonged downfall. Photo courtesy Jim Thode. Organize your fellow trail riders and form a riding club. Clubs can focus on both enjoyment and trail stewardship by informing members about trail conditions, who can use private land trails and communicating with the land owner to resolve developing issues. Post current information on your website, social media or your email list! For more information on organizing a trail club consult the ELCR publication “Getting Organized – Creating Equestrian Trail Organizations” available on-line here. Local/regional and state parks divisions often post trail conditions and emergency weather situations with advice about trail closings on websites and Facebook. For example, North Carolina State Parks (www.ncparks.gov) has an ‘Alerts’ section that indicates trail conditions, openings and closings. Users can easily check trail conditions, and adjust plans as needed. If your club uses these public trails, you can check these alerts and re-post them to your club’s media. Private trails may require more effort, as landowners seldom post information about trail conditions on their own land. What can you do? When the owner can’t provide information, designate certain club members to observe and report unfavorable trail conditions to the club manager. Post information on your club’s media or email. For example, the Foothills Equestrian Trails Association (FETA) helps to protect the community’s equestrian trails system by limiting access to Association members and their guests. Conditions are strictly monitored and posted on Facebook. 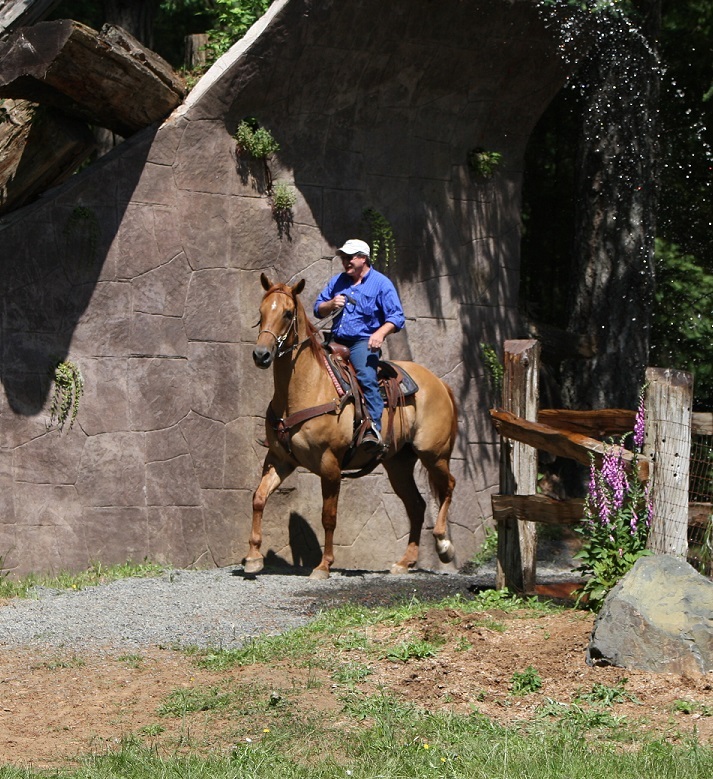 Stay abreast of new trail planning in your community and help to ensure that new trails and repairs to damaged trails are designed to shed water and hold up under the stresses of equine use. Don’t know what makes good trail design? A good place to start is with the excellent US Forest Service manual ‘Equestrian Design Guidebook for Trails, Trailheads, and Campgrounds ‘, by Jan Hancock et al. Available online here. If you ride or otherwise enjoy trails, volunteer to help with trail maintenance. Contact your local chapter of Back Country Horsemen. They perform and track countless hours of volunteer trail maintenance activities nationwide. www.bcha.org/reploc/. For additional information and post-able public service announcements to help spread the word, contact ELCR, and remember – Respected Access IS OPEN ACCESS! This article is reprinted with permission from the May 2015 issue of The Trail Rider. To subscribe, please visit TheTrailRider.com.